On 12-19 Jan 2019, in Pietermaritzburg, South Africa, a week-long training course on “Applying Satellite Remote Sensing for Water Resources Management in Africa” was held. Hosted by the University of KwaZulu-Natal (UKZN), the course was organized under the auspices of UNESCO’s programme on Enhancing Climate Services for Improved Water Management, or CliMWaR, and the Global Network on Water and Information for Arid Lands, or G-WADI. ICIWaRM is the Global Technical Secretariat for G-WADI. The 28 participants came from Angola, Botswana, eSwatini (Swaziland), Ethiopia, Lesotho, Malawi, Mauritius, Namibia, South Africa, Tanzania, Zambia and Zimbabwe. The training course was created to help African water planners and managers overcome the lack of data on ground-based precipitation, soil moisture, groundwater levels and streamflow. Extensive use was made of drought- and water-resources products and platforms developed in part through ICIWaRM funding in collaboration with G-WADI. These included the African Flood and Drought Monitor created by Princeton University and the PERSIANN family of real-time and historical precipitation products of the University of California, Irvine. At the end of the course, six participant teams gave final presentations on water balance in catchments around Pietermaritzburg, using remotely sensed and other data. 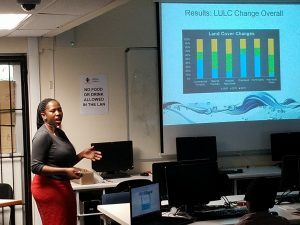 In addition to the UKZN and UNESCO IHP, the course was organized by the University of the West of England’s Centre for Water, Communities and Resilience, the International Water Security Network and the Institute of Natural Resources, Pietermaritzburg. Numerous international and South African institutions collaborated to make the course a success. The presentations and exercises can be found online at the UNESCO CliMWaR site.